There's something miraculous about watching plants start off as seeds and grow into something large, beautiful, and edible. The whole idea of seeds fascinates me. I mean... seeds are tiny. Puny. 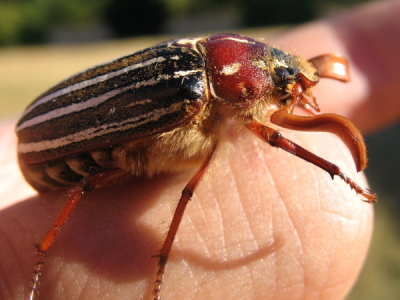 And then they grow into something that produces hundreds of seeds. In some cases, thousands. It's like... food forever. While this whole process of growing from seeds and multiplying is pretty much the most basic concept of life, I feel like it's some great secret I've stumbled upon, and I'm baffled why everybody doesn't wish to grow their own food. And I guess the reality is that people are willing to exchange money for their time and labor; instead of getting their own hands dirty, they work at their chosen profession and trade the results of their work with food -- that's what the market is. 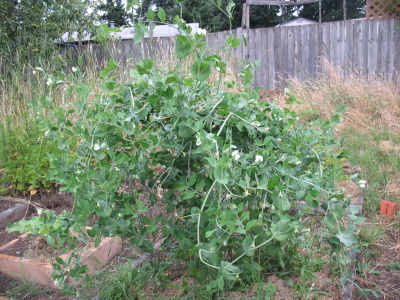 However, as eating is a necessity, it seems prudent that people maintain at least a small edible garden. 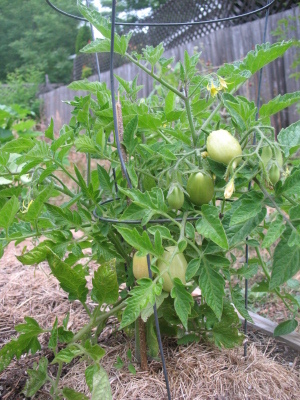 My cute tomato plants are doing quite well; I think I have nearly 30 roma tomatoes growing on three plants. 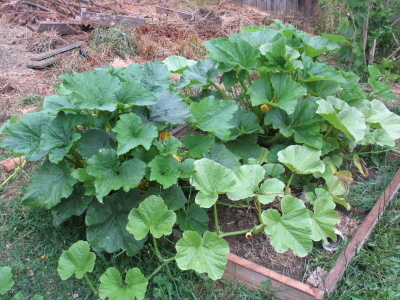 Here is my zuccini and pumpkin patch. I had no clue they would grow so large. I'm going to have to dedicate more space to them next year. My snap peas got so large that they overran their little support. Next year, I'll have them growing on something that'll support their weight a little better. 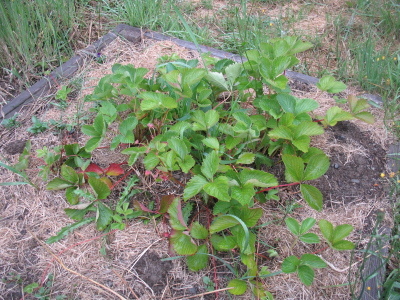 Same strawberry patch, August 2008. Amazing amount of growth. 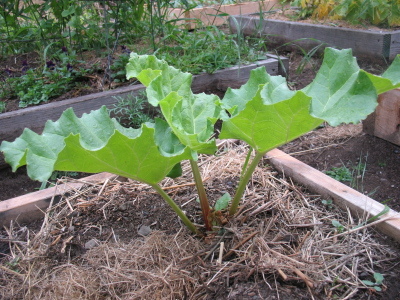 This is the rhubarb I brought over from my brother-in-law's house in Eastern Washington. 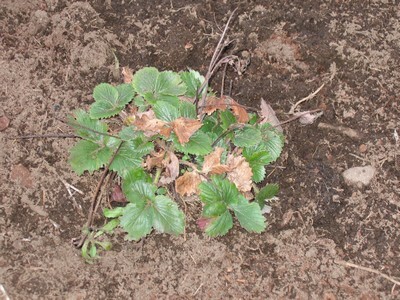 It started off as a single tiny leaf, and after cutting it back a little, it just took off. 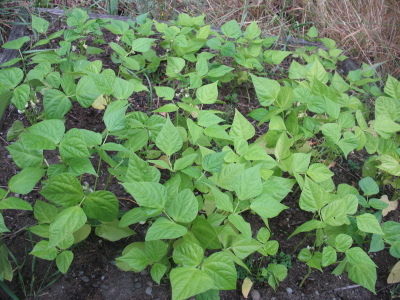 My late bush beans are doing well, and are throwing up tons of seed pods. I don't really like string beans all that much, but it's food. I'll eat them. It turns out that radish seed pods are delicious -- crunchy like snap peas, but with the flavor of a radish. And there's much more to eat by leaving the bulb in the ground and letting it make seeds. 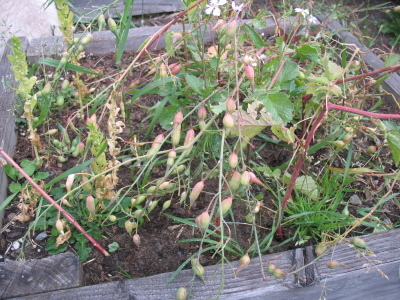 This late in the season, the seeds are all a bit woody; they'll be used to start next year's radishes. And in fact, I didn't plant any radishes this year -- these are all from last year's seed pods. 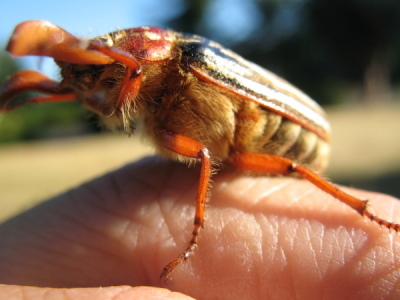 And here are a couple of cute pictures of a june beetle that I found in my front yard. I just figured I'd add it to the collection of pictures of living things. We love to grow our own radishes and other veggies! That bit about the radish seed pods was new to me and amazing information. Who knew?! I forgot about my radishes and then they made flowers that the bees absolutely went crazy about so I left them a little longer, only to discover that they made seed pods (I know - duh - but I'm new to gardening). Guess I'll save some to plant next year and eat the rest - yum ! !